At least a couple of people have wondered why I haven't posted anything on my blog. Folks have been asking why I haven't posted anything. Been distracted because my wife and kids were en route to Karachi. Finally had them rerouted directly to Delhi from Hong Kong, skipping Karachi for now. I hope to write and post. For now, you can catch me on The Forum on KQED tomorrow morning. 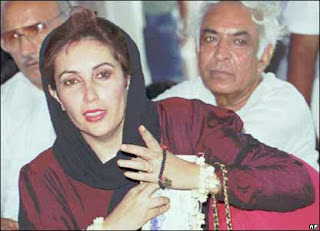 Notes on the quote on the subject and on the photo above: The photograph above often appears on Wikipedia articles and updates about Benazir. It is an image I captured myself at Chandini Restaurant in Newark California on September 28th, 2004 and made available under GPL License through that site. (See articles on my blog here and here.) The quote is from President Hamid Karzai of Afghanistan, the person she met as her last official appointment. "Civil Society" has become the new touch phrase in Pakistani politics. And it's gotten to the point where people express the same kind of cynicism about it that is usually reserved for words like "Islamist", and "War on Terror", and, well, "Progressive Islam". A friend on one of our alumni mailing lists was getting pretty disgusted by Nawaz Sharif's piling on to the Civil Society bandwagon. And in our own situation in Pakistan, it is important to keep people honest in their language.I think it would go go a long way towards a better society. And honestly, I have the same attitude towards "terrorism", "moderate", "Islamist", etc. See, for example, my post on the concept of one man's terrrorist being another man's freedom fighter or other posts on being flip with language, such as this one about terrorists that are "Hindu" or "Islamic". Anyone who's not affiliated with a political party or a government servant (including military). What's yours? What's your pet peeve in terms of language? Geo Taken Off the Air by the UAE...but how is this surprising? Miriam Webster defines "shocking" as " extremely startling, distressing, or offensive". Offensive, yes. But startling? Unless you were--and most of us were--in denial, how is this startling? Distressing, well, if your world view was built on absolute monarchies doing the right thing more often than not, than yes, I can see how it would distress you to see them do othewise. Startled I am not. My dear mother would have loved for me to live and work in the Gulf and I always said “Pinjra pinjra ho tha hai; chahay sonay ka ho.” [A cage is a cage, even if it is made of gold.] The places are absolute monarchies and they have always had very good relations with Pakistani governments, especially absolute Pakistani governments. You’ve seen all those creepy photos of George Bush rubbing up against Pakistan’s President Pervez Musharraf, the two of them grinning and giggling like they’re going to the senior prom. So it’s hard to remember that it was Hillary and Bill who brought Pervez to the dance in the first place. Folks I need to get some sleep. I have installed Picasa and will get more functional on the Wiki and lists and so on tomorrow. Promise. Shab Bakhair, as the traditional greeting goes; a good night to all--and may the Subha, the morning, be even brighter. I am not kidding when I say that my pride and joy in all the activism and engagement we are seeing today far, far outweighs my pessimism over where our country and our communities (South Asian, Progressive, Muslim, ...) find themselves today. At least for this one moment in time, it is good to be part of something. From this Martial Law; Freedom! From this General Zia; Freedom! From this Black General; Freedom! ... so said Faiz Ahmed Faiz, probably the most popular poet of revolution in the latter half of the 20th century in South Asia; Pakistan, India, and particularly on the Left. for updates. And contribute what input you can, participate in whichever way you can. When I got off the plane at JFK, I saw a typically short report on CNN that Emergency had been imposed and immediately started Facebooking with a couple of journalists on the ground in Pakistan. Since then, it seems like Pakistanis are starting to step up to their moment of truth. As Adil says, people see a picture and all they feel is shame for the 5 policemen beating up a lawyer; I feel nothing but pride, for I see one Pakistani putting his self on the line for his principle. People see a media blackout; I see journalists that a dictator has no choice but to ban. You can read more, and find links to more, on the pages referred to above. More later. While the blog is constantly being updated about the events as they unfold, I am sure there would be concerns about law and order situation in the city. PS, 7:10 pm Pacific/7:10 am Pakistan ST: We're all assessing what's going on. The words "Martial Law" keep being used. Technically, the government is trying to pass this off as a constitutionally-defined "Emergency". There's a difference. For Civil Society in Pakistan--the media, the human rights activists, the lawyers, and the bloggers--this is our moment of truth and the folks on the ground need all the help, support, encouragement and recognition they can get. In the idiom of South Asian sport, Well Played, Adil Bhai; Bahoth Aala, Adil Bhai! Thank you to all for their kind wishes and congrats. I should add, however, that the Nobel was awarded to the work of the IPCC (a panel of eminent global climate change experts), so I am just one of the many experts on that Panel. I have served on the IPCC for some 8 years, the last many as a Convening Lead Author. So, yes, it does feel terrific to have one’s work and research celebrated by the Nobel Committee, but it really is an honor shared by many (including by Dr. Tariq Banuri who played a leading role in the IPCC’s evolution in the past). Some links: Dawn, Boston Globe, The Fletcher School. Personally, as I was saying on my Facebook status, my family and I are not in a very festive mood on this festival. But our prayers are for everyone to receive all the blessings of Eid. Mabrook! Eid Mubarak. Have a Blessed Eid. Ramadan Kareem! The Noble Month of Ramadan is coming to and end and the blessed festival of Eid-ul-Fitr is upon us. It is a time when Muslims the world over focus on spirituality, compassion, patience, peace and the joys of having completed a month of fasting for the pleasure of God. Two months and ten days from now, we will all celebrate Eid-ul-Adha, the time of the year when we focus on sacrifice, humility, dedication to our faith, and the blessings of the pilgrimage for our community. ‘Tis the season, as the saying goes, to renew our deen, our faith in Islam, a religion that derives its very name from the same root as a word for peace. Over the years, three or four clear positions have evolved within the global Muslim community and particularly in North America with regards the method of determining the dates of these holy days and month, with some advocating for local moonsightings, others preferring to follow Saudi Arabia, yet others relying upon astronomical calculations, and so on. Each group holds its position in all sincerity and with great passion; each group has faith, tradition, and logic to back up its position. Unfortunately, the differences in approach, and the strength with which each position is held, often lead to disrespectful exchanges within the community, and even to lasting grudges and ill will between neighbors, friends, and members of local congregations. This year, and in future years, we at the Muslims for Progressive Values would like to invite everyone who identifies themselves with the community of Muslims, or who participates in the cultural life of the Muslim community, to make a commitment to engage with people who hold different positions on the matter of dates and calendars (or any other issue) with respect, good will, and compassion. If we can pass this test of fraternity within the community, if we can treat other Muslims with respect whether we agree or disagree, and do so without losing sight of what holds us together and makes us brothers and sisters in our faith and our humanity; if we can do that, then we can try to begin fulfilling our role as the upholders of peace and justice and truly be the best of communities. The month of Ramadan, the Hajj season, and the days of the Eids are some of the most blessed moments of our calendar, let us try to fill them with peace, compassion, and good will towards all humanity; and let us start within our community. We pledge to engage with respect and good will towards those who hold views different from ours on the calendar of our festivals. Wa Allahu Aalam, only the Almighty has perfect knowledge. Adil Najam's recent post on Pakistaniat is quite a cry of pain and a call to arms; he's not someone that jumps into political frays--least of all on a site he's invested blood, toil, tears, and sweat in building over the last year and a half as an inclusive space. Do read it. And the point is not that I think no one has the right to hold the political, theological or social opinions the Taliban, the Jamaat, or anyone else holds. But subverting the writ of the state is not in the tradition of The Prophet of Islam. (SAW) He did not take up arms until a community elected him Head of State and he was at the head of a government. I just heard the anchor--not a guest, the anchor--of a news show confront a member of the federal cabinet on live TV about their attitude towards the press. "Why don't you just go ahead and ban the press--put us all in jail?" he said. And it wasn't the US of A (sorry folks!) or Western country--but it was in a Muslim country; the 2nd largest Muslim country. And a lot of people--including Aitzaz Ahsan, the lawyer for the famous Chief Justice case--have been going around they are ashamed of their country today, and that the events in Pakistan on September 10, 2007 lower the moral standing of Muslims in this day and age. I am not. I am very, very proud of Pakistan and Pakistanis today. And I am especially proud and honoured to have been a member of the Pakistani press; and a Muslim who works in media when I can. A lot of them free and a lot of them in English. 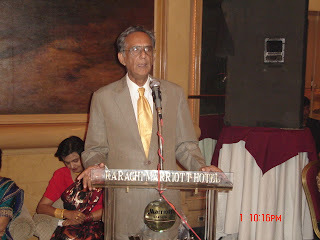 Hyderabad is a multi-religious and multi-cultural abode for millions of people, and this is not any recent phenomenon. Multiculturalism is the very foundation of this great city. It is said that some 400+ years back, Prince Quli Qutub Shah of the Qutub Shahi dynasty fell for the beautiful Bhagyamati and rebelled against his father, the King, to marry her. On becoming King himself, he bestowed upon his beloved Bhagyamati the title of ‘Hyder Mahal’. It was this romantic and chivalrous king who—like the emperor who created the more famous monument to love in Agra—built a whole city on the banks of river Musi, and named it after his beloved wife. That is how Hyderabad happened. While laying the foundation of this city, the Sultan is reputed to have prayed to his Creator that “Let millions of men and women of all castes, creeds, and religions make it their abode, like fish in the ocean." And truly, the Almighty heard every word of his prayer. For over 400 years, Hyderabad has lived up to the romance of Sultan Quli Qutb Mulk, wherein people of different religions, languages, and ethnicities have dwelled and prospered peacefully. The vibrant, rich, and progressive culture that we see in the air of Hyderabad today is the cumulative love of the 400 years since the Sultan’s prayer. Love, however, has its enemies everywhere. This romantic and peaceful city was brutally stabbed on 25th August, 2007 by people with no love and no respect for humanity—by those who hate to see love blossom; by people envious of Hyderabad’s peace and tranquil. It was like stoning a lover whose only crime is that he believes in love and compassion. But the thing about love is, it’s not just brave and immortal–it’s also undyingly optimistic. Hyderabad, the city of love, has always braved incidents triggered by the hate mongers, and persevered with the message – loud and clear – that it will not give up its character. Surely, the Sultan’s prayer has more power than the evil intent of a few hate mongers. The peace march in which we participated on September 1 was but a fulfillment of the Sultan’s prayer and his wishes. A multitude of us Hyderabadis, with varying ethnicities and beliefs, uniformly clad in white kurta/shirts, with a heavy heart and a message of peace, walking silently over a kilometer’s stretch, and finally lighting candles and praying in front of Lumbini Park – I promise, Sultan Quli Kutub Shah must have been be very proud of his city this day. I thank all who participated. God bless Hyderabad and God bless you all. "The text, deleted in November 2005, was quickly restored by another Wikipedia contributor, who advised the anonymous editor, "Please stop removing content from Wikipedia. It is considered vandalism." Secondly, journalists are doing such a hack-job of this. The para I quoted above seems to imply that this was something unusual and the message from the editor was spontaneous--it's not; the message is now an everyday--or several times every second (and I am not exaggerating)--occurrence. The report on the BBC's site was even worse. What all this does do is help us see what unethical behaviour folks are up to--Diebold, and everyone else. Is he always this long-winded? Or is it just becuase he's having to say sorry that it is difficult? That's the longest I have seen any one take to call someone a rich brat who's caused a mess. I like the fact that he only blames the troubles of Iraq on the last 35 years and doesn't go for the Western Establishment's usual "hundreds/thousands of years" that X non-white population has been dysfunctional. I agree with the Achilles Heel theory that some folks mentions--that this is basically a way of neutralizing something that could hurt him politically. But he is, in effect, saying "It's not my fault; Harvard made me do it." Which only confirms that he's now all politician--and not the kind of politician folks love, neither. The other issue a friend raised was why he said all that in the NY Times and not a Canadian magazine. My reaction is that I think that is but appropriate. His support for the Iraq War was as an academic/pundit at an American institution--you could say as an American pundit, in a manner of thinking. Or you could say that he work in support of the War was done while at the center/capital/seat of the empire, and it is only fair that he make his mea culpa's in the same forum--The Forum in Rome itself, if I may use the metaphor. In fact, the fact that he did in that forum might actually mean that it is a real conversion/Road to Damascus moment or what-have-you. "And Pakistan needs more than F-16s to combat extremism. As the Pakistani government increases investment in secular education to counter radical madrasas, my Administration will increase America's commitment. We must help Pakistan invest in the provinces along the Afghan border, so that the extremists' program of hate is met with one of hope. And we must not turn a blind eye to elections that are neither free nor fair --our goal is not simply an ally in Pakistan, it is a democratic ally." I don't need to tell y'all that the excerpt above is from the same Obama speech that is being quoted and re-quoted today. "a misguided invasion of a Muslim country that sparks new insurgencies, ties down our military, busts our budgets, increases the pool of terrorist recruits, alienates America, gives democracy a bad name, and prompts the American people to question our engagement in the world..."
then advocates unilateral military action within the sovereign territory of the second largest Muslim nation in the world--five or six times as populous as Iraq. If George W. Bush is not the only one who can't formulate any polcy beyond alternating between supporting dictators with military aid on the one hand and the unilateral use of military force on the other--notwithstanding what I quote Barack Obama as having said in words that sound like wonderful music to the ears of this Pakistani resident of the US--then what hope do we have for world peace? I am copying this mail to the editors at the South Asian Journalists' Association Blog and Pakistaniat.com, probably the most popular blog in the Pakistani American community. Hopefully they will consider it or inclusion/posting. If anyone wants to discuss these issues further, do drop me a line. "In fact, Ashraf's politics differed greatly from his father's, but, he explains..."
"Ashraf's politics has moved to the Left over the years, away from his father's, but, he explains, ..."
Otherwise, Tanzila "Taz" Ahmed and the editors seem to have done a pretty good job. Besides the personal recognition, for which I am grateful and humbled by (despite the tone above ;)), giving air time to Muslims who are going about being who they are in an alternative, confident unapologetic, way is cool. Who'd think that in this day and age, when a magazine sets out to find Muslims who are just like anybody else in society--and isn't that what everybody that wants to humanize Muslims does?--they'd end up profiling a punk rock band called "The Kominas". And I have to say, I loved the description of Wire Tap Magazine: "a national online magazine by and for young people". It resonated. I started my writing career as the editor of The Teenager, Pakistan at the age of 17 and at that point, it was one of very, very few outlets for Pakistani Youth (and about the only one in English). And a shout-out to Eteraz, who pointed Ms. Ahmed to the MPV and me when she reached to him looking for a Progressive Muslim blogger to profile. I first came across the sentiment I want to talk about in a video of a lecture by Zaid Shakir or someone, in which a young person asks him, after his lecture, if he heard him right when he said that it is our duty, as Muslims, to be kind and just (I forget the exact words) in our dealings with people. The young man's question was whether it was a duty to deal well with Muslims or all of humanity. And now there's a quite a discussion going on at the Muslim Bloggers Alliance blog (and a cross-post at the author's own blog) about a very similar issue. The question, in this instance, is whether a hadith (a report of something The Prophet said or did) that says "No one truly believes until he wants for his brother what he wants for himself." applies only to fellow Muslims or to any human being. While that hadith in itself, since it refers to a "brother", and is easily interpreted to mean a brother in faith, the question is important. It is very exasperating for people like me to hear things like "we Muslims have far too long advocated an exclusivist philosophy". Funny thing is, most young American Muslims often dismiss the way Islam was traditionally interpreted and practised (Hanafi, Shafi'i, Maliki, Hanbali, and the two Shi'a schools) as either "medieval" or "bid'a-ridden". I am not a scholar so I can't speak of whole schools, but I am a person brought up by traditional Hanafi parents (South Asians--who make up a good 30-50% of the Ummah) and who had my early education in government schools in (then traditionally Maliki) Northern Nigeria. And I have always understood "brother" in the hadith in question to mean "the next man". Man. Not Muslim. And the curriculum in Northern Nigeria, my parents' upbringing--all of that was not put in place because "political considerations have come into play". It was what a *lot* of very traditional Muslims held to be their faith. I know WHY he did it, but it is very vexing that my brother Naeem has to say things like "...this otherwise excellent posting..." and "Before somebody accuses me of reinterpreting this hadith for my own purposes, they should know that this is the understanding of the scholars from centuries back." I say that in a lot of these matters, we only need look back half a century to what the conventional wisdom was in the Muslim world. And I am not defending the misogyny, illiteracy, and corruption that a lot of Muslim cultures were ridden with. I am an activist who grew up in Northern Nigeria and Pakistan and have worked in the field of human rights on the ground in Pakistan. 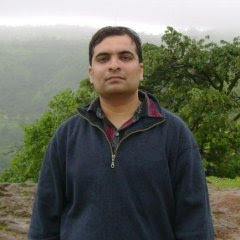 I follow affairs in India very closely and have friends and relatives there. But American and Western Muslim friends have often asked me in the last few years, as I got involved in organizations and efforts that carried the "progressive Muslim" label, "..but, but Islam is progressive in its nature; why do you need to say 'progressive Muslim'?" This kind of issue is exactly why. I have often had to say to people: Islam told us to be nice to our neighbours. Not to our *Muslim neighbours*. The Prophet and Awliya and Ulema down the centuries have set an example of good conduct and actively looking out for the welfare of even their Jewish neighbours. A story is told of one aalim, of how he had a neighbour, who just happened to be Jewish, who would intentionally disturb him, especially during worship. Then, for a few days, the disturbance stopped. The aalim took it upon himself to find out and discovered that the man was ill or something--I forget the exact details--and took it upon himself to help. THAT was the Islam I was brought up in. And I am thirty-six. My upbringing was not changed because of events in 2001 or since. Today, do most of us even know the names of our non-Muslim next door neighbours? Islam is by definition progressive and humanistic; but how we often understand it, especially how we have come to understand it in the last 2 or 3 decades, and how Muslims have come to practise it, is not at all humanistic, humane or compassionate. Looking out for your own tribe is not compassion. It is not Ihsan. It is parochialism. Being just only to members of your own tribe is not adl. It is discrimination. Surah 60, Verse 8: 8. Allah forbids you not, with regard to those who fight you not for (your) Faith nor drive you out of your homes, from dealing kindly and justly with them: for Allah loveth those who are just. Tell me He is not telling you that he will love you for being kind to non-Muslims--who are not belligerent towards you. In my late 30s, and having lived under more than half a dozen military dictators, all forms of corruption in the Third World, and at the receiving end of the American Media, there is little that surprises me. But I have to admit that it amazes me no end that whether a Muslim should be kind and humane towards non-Muslims is even a question. 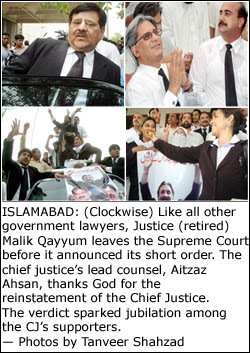 This is the man who actually led the legal battle to reinstate Pakistan's Chief Justice. I don't know, just something about his gesture of thanking The Almighty says so much. And that he's quite a dapper-looking gent doesn't hurt either. ISLAMABAD, July 20: With his rambling, legalistic speeches and his lazy eye, Chief Justice Iftikhar Mohammad Chaudhry has become an unlikely hero for opponents of President Gen Pervez Musharraf. The 59-year-old judge, in his signature black suit, has been showered with rose petals by tens of thousands of cheering supporters on a series of road shows since President Musharraf suspended him for alleged misconduct in March. On Friday, the Supreme Court reinstated him and overturned the charges against him, sparking jubilant celebrations outside the court.“This man has shown a lot of courage,” said political commentator Shafqat Mahmood. Justice Chaudhry’s journey began on March 9, when television footage showed him being summoned to meet Gen Musharraf, in army uniform, at his residence to answer the charges against him. It was an unprecedented moment in the country’s 60-year history and sparked outrage among the lawyers’ community. The charge-sheet against the Chief Justice included claims that he abused his position to land a top police job for his son and get cars he was not entitled to. He was also accused of ordering intelligence agents to spy on other judges. The judge later said he was detained for five hours and pressured to resign by top intelligence chiefs, but refused to do so. He was kept under virtual house arrest for several days. Ironically, Mr Chaudhry was one of the judges who validated Musharraf's takeover and dismissal of the civilian government of former premier Nawaz Sharif after a bloodless coup in 1999. President Musharraf appointed him as chief justice in 2005 and personally swore him in -- providing the only other picture of the two men together, with Mr Chaudhry in ornate ceremonial robes and judge's wig. But his backers say Mr Chaudhry started to anger the government by breaking with precedent and taking notice on his own jurisdiction of some 6,000 cases, particularly on human rights. One landmark decision was the overturning of a lucrative sale of the Pakistan Steel Mills to a private consortium last year, which embarrassed its brainchild, Prime Minister Shaukat Aziz, and sparked allegations of corruption. Another significant development was the way the Supreme Court used its powers to delve into the forced “disappearances” of hundreds of people, taken away by the all-powerful intelligence agencies as part of the “war on terror”. Many of the missing people were linked to a three-year insurgency by autonomy-seeking tribal militants in Balochistan, Mr Chaudhry's home province. The Chief Justice's crusading stance raised fears that he would cause trouble for President Musharraf ahead of presidential and parliamentary elections that are due in the coming months. President Musharraf hopes to get himself re-elected as president-in-uniform by the outgoing parliament this year, defying the Constitution which says he should quit as head of the military by the end of 2007. Long-term friend Hadi Shakil Ahmed said Mr Chaudhry had shown the same independent streak when they were both lawyers in Balochistan, where Mr Chaudhry joined the profession in 1974. The same friend, having come up politically in a religio-political party in his student days, now says that each of these things (Lal Masjid, the CJ, May 12th...) are distractions from the neo-liberal selling out of the country under an international banker's supervision. Of course, he didn't use the phrase "neo-liberal selling out", but was talking about things like Mr "Shortcut" Aziz's government's total neglect of the sector that is the backbone of the country's economy: agriculture. We Pakistanis used to pride ourselves in the 70s and 80s that no one was dying of hunger in our country--we had our first few farmer suicides (a phenomenon that's been going on in India for while) in the last year or so. So now the people have a victory. And the rule of law is big in the words of leaders. 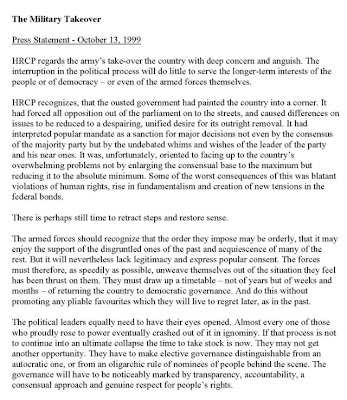 The full statement from the Human Rights Commision of Pakistan (HRCP) is at right. That's who we should all be working with and supporting. But what do I know? I am just an elitist liberal from Pakistan. Having said that (as I did in email, earlier in the day) a friend chastised me for a negative note on the one day that Pakistanis can feel proud. I take time out regularly to be proud of things Pakistani--and I often do it "off-season", too, not just when the whole crowd has deigned to join us; see here, here, here, here, and here, for example. I don't want to be the wet blanket on happiness. I celebrate today, a victory for the people. Sulthani-e-Jamhoor ka athaa hai zamana and all that. I love it! But tempering joy with some of what we have learnt in the last 3-6 cycles we have gone through might not be a bad thing. But then, like I said, what do I know? I am just an elitist liberal from Pakistan. PS: A shout-out to the Teeth Maestro for providing the inspiration for the subject line by pointing out the uniqueness of the date. 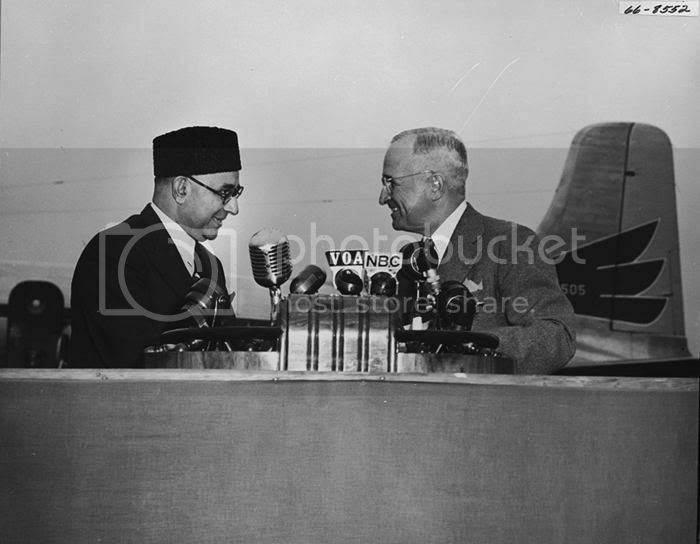 It is really odd--about 50 years ago, the government of Pakistan convened a council of Ulema to decide "Who is a Muslim?" Having declared ourselves an "Islamic Republic" the matter was legally pressing. Their decision in the end was that the State and community must recognize anyone who claims to be a Muslim to be a Muslim. That was the official position of the 2nd largest Muslim nation in the world--then the only "Islamic Republic"around--and that of its Ulema. Today, only the most progressive of organizations--who you, it seems, do not want to consider properly Muslim--holds that position. The Robert Jensen article keeps coming up...where, as I saying earlier, we have Farid Esack, Junaid Ahmad, and Robert Jensen telling us that Pakistani liberals, it seems, "[i]nstead of talking about these fundamental questions of justice" "might ignore ... movements [like the Lal Masjid brigade] and conflicts in the outer provinces" ... and yet "found it offensive that such an embarrassing incident could happen in the capital, where the world eventually would pay attention." What I get from this article is that there are two, and quite reminiscent of George Bush, only two possible ways to look at the phenomenon of this fanatic, militaristic manifestation of Islam coming out of Pakistan. You either caricature it, or you give it the sympathetic hearing these respectable---and I mean that without sarcasm--want to give it on the premise that what Abdul Rashid and his cohorts are about is those "fundamental questions of justice". All of which amuses this Pakistani liberal/progressive/whatever no end. (As a friend of mine just put it over the phone from Pakistan, "when it comes to Pakistan, the definition people seem to have is that if you're not a mullah, you're liberal"--a definition these gentlemen seem to subscribe to.) Especially since I am FROM one of those "outer provinces". And the descriptions of the bullet-marked madarassah in Islamabad that everyone is wringing their hands about could very well have been a description of any of the colleges and universities we went to in the 80s and 90s in Karachi. We've been living at the business end of the firefights between the mullahs, the military, and the militant ethnicists for a few decades now. And I am sorry, but my personal experience--and I guess it is biased by my dealings with the "moderate Islamists" that I keep hearing about (the Jamaat-e-Islami and the Islami Jamiat-e-Talaba was our local manifestation)--is of exactly us "liberals" having been the only ones actually working on human rights, and freedom of speech and the like, when these Mullahs were in government with the last military dictator we had. Was it these Mullahs lining up to take on General Zia or Asma Jehangir? Islamism, Episode 1: "My qualm is with Islamism and not with Islam"
You've obviously titled your book "The Islamist," which is a bit of a loaded word these days. What is your definition of "Islamist" as you're using it in this book? Ed Husain: In very broad terms, three things. Firstly, there's the rejection of 1400 years of Muslim traditional scholarship and re-reading of scripture with political lenses. Secondly, they advocate a world view that's based on eventually at some stage confronting the West. And thirdly, they reject mainstream Muslims and give us all sorts of labels such as 'non-practising Muslims', 'jahils', 'partial Muslims', and so on. Generally it's those three things and all of this is underwritten by the works of particular writers - to be more specific, Sayyid Maududi, Sayyid Qutb, Taqiuddin al-Nabhani and, in our times, Fathi Yaqoun, and so on. It's a really important question, especially from a Muslim point of view because many Muslims confuse Islam with Islamism. The lines have been blurred and my qualm is with Islamism - the ideology that's been set up in the name of the faith - and not against Islam, the religion that our Prophet left us and which was developed by our scholars of all traditions - Shia, Sunni, whatever. My qualm is with Islamism and not with Islam. I think increasingly Muslims, thanks to Islamist propaganda, have failed to see the difference between the two. Now on to what I'd really like to see in the blogsophere: Purabiya, Bhojpuri, Avadhi, ... or at least the blogging equivalent of what Inshajee wrote. I have been hoping to put my thoughts on events in Karachi on May 12th, and the fall-out together. Then I stumbled back into something written by an old, old associate--the man's gone through a lot in the years since I knew him, but his voice and his content is still as clear, as unconventional, and as capable of inducing discomfort in the reader or listener. So for those who comment and go on and on about Karachi, here's something to think about--from one of Pakistan's most acerbic, uncompromising (the Urdu word I am thinking of is "تلخ") voices in Pakistan. You must be following the immigration reform debate, and the collapse of the immigration reform bill (S.1639) on the Senate floor last week. The primary reason the bill was voted down was because several senators thought it provided "amnesty". However, numerous immigrant advocacy groups also opposed the bill because of the devastating impact it would have had on immigrant communities. Given the options on the table at the present moment, the death of the bill might have been the best possible outcome. But it is awkward and unfortunate that the bill was voted down for all the wrong reasons. Clearly the bill was at odds with the demands of the immigrant rights movement; and the failure of the bill only shows the strength of the ultra-right. I wrote the following Op-Ed (published in the print edition of this week's India-West, dated Jun 29) in conjunction with SAALT before the bill was voted out. I wrote it in response to a general tendency amongst my some of friends and peers (H1-B workers in the tech industry) to view undocumented immigrants as their adversaries; and that policies that attempted to (or appeared to) provide even a modicum of relief to mitigate decades of injustice to undocumented folk (sloppily at that, like the current bill) were "unfair" to H1-B and other "legal" folk. South Asian Community Urged to Stand Up for Immigration Reform It is time to realize that immigrants of all status are our true allies—and that it is in our interest to fight for fair immigration laws for everyone. Immigration reform is a hot topic these days in my circle of friends and peers in the South Asian community– many of whom, like me, are first-generation Indian immigrants on H-1B visas. As the debate in the Senate proceeds again, it is refreshing to note that South Asian immigrants are becoming more engaged in understanding the impact of the proposed legislation (S. 1639) on our community. But while we try to understand how the bill affects immigrants, it is also important to look at the legislation–and immigration reform policy—as a whole to see if it is really fair to everyone across the board. The proposed immigration bill in the Senate is controversial for many reasons. It contains provisions that would affect families and workers negatively, for example. It also creates a merit-based point system for obtaining green cards. The Senate bill is problematic for a range of immigrants, including people in situations like mine. I am in my seventh year as an H-1B worker, and personally empathize with the call to reform the immigration system. My employers filed an application for a green card on my behalf in 2003. My application languished in the system for four years before the first stage of the process—the labor certification–got approved a few months ago. Ahead of me is a wait of approximately 3 years, perhaps more, given the nature of today's immigration process. based visas from 140,000 to 90,000, exacerbating the current visa backlog. As we analyze the impact of the Senate bill, it is also important to keep in mind that green card holders, undocumented immigrants, and workers of South Asian descent all have a stake in immigration reform. We are intricately linked and share common aspirations as immigrants to this country. We also are products of immigration policies that are generally not made with our interests in mind. The argument thrown around in some South Asian circles is that any immigration reform legislation should benefit skilled workers first and foremost. Some say that immigration reform should not benefit undocumented immigrants, who have "violated the law" and not "played by the same rules" as legal immigrants. Let's examine some of these arguments more closely. First, the definition of who is "legal" and who is "illegal" has historically been a constantly changing one based on economic needs. We have to realize that a vast majority of undocumented immigrants had no legal means to come work in the U.S. in their job categories, while H-1B workers and other immigrants had that option. If there were legal paths for undocumented immigrants, would they have had a need to break the law? In the context of the Senate bill under consideration right now, it is clear that undocumented immigrants are actually disadvantaged due to a merit-based point system that assigns a range of criteria to determine who obtains green cards. The merit-based point system would in effect establish an explicit class-based discrimination system by ostensibly preferring"skilled" over "unskilled" workers. The criteria used to determine who gets green cards include education, employment and English-language ability. Under the point system, working class South Asians such as cab drivers or domestic workers will obtain fewer points than individuals with educational degrees or work experience. Some may argue that this is fair from an economic standpoint–they say that the U.S. economy, to compete and remain a leader in the world, needs more skilled workers than unskilled ones. But is that argument fair or humane? The bottom line? The Senate bill is antifamily and antiworker. If the bill is passed in its current form, it will have far-reaching negative consequences for all immigrants including South Asians. We, the H1-B workers, were conspicuously absent last year when the immigrant rights movement needed us. Now, as we become more engaged in the debate and the possibility of a new immigration law looms ahead of us, it is time to realize that immigrants of all status are our true allies—and that it is in our interest to fight for fair immigration laws for everyone.